Magento 2 New Year’s Resolutions For SEO - Business Trend Solutions inc.
Search Engine Land defines search engine optimization (SEO) as the process of getting traffic from the “free,” “organic,” “editorial” or “natural” search results on search engines. Among these, organic traffic from search engines through SEO is of paramount importance for e-commerce websites to be successful. Among all e-commerce platforms, Magento is the most powerful in terms of SEO. As for Magento 2, it provides better SEO options. It helps to increase the chance of good SEO by allowing website admin to implement it. SEO is always changing; falling behind can result in a crushing blow for many businesses. If you want to increase your sales and leads, reach new customers, improve brand credibility, gain market share or build trust and credibility, SEO is the way. Ready to reap the rewards of Magento 2 SEO? Robots.txt is now editable from the Admin panel. XML Sitemap: priority and frequency for each page type, robots.txt file integration. Category Page: meta tags, SEO-friendly category URL key. Product Page: metadata, canonical tag, product URLs. Product Image Labels is another Magento 2 SEO feature. Rich Snippets are the most anticipated Magento 2 SEO feature. Schema.org is added to a default Magento 2 Template. Related products, Upsells, and Cross-sells are also optimized in Magento 2. Google Tag Manager is a unique feature of Magento 2 Enterprise Edition. Universal Google Analytics, E-commerce Tracking, and AdWords Conversion are available out-of- the-box. Let’s take a look at the steps one by one. Enable SEO configuration by navigating to Store => Configuration => Web => Search Engines Optimization => Use Web Server Rewrites => Yes. Another good thing to configure is “Add Store Code to URLs” under “URL Options”. In most cases, it is better to set this functionality to “No”. Metadata is essential for a website. Ensure that you have filled out all meta information for all your CMS pages, Product detail, and Category pages. Also, include at least five keywords that are necessary for pages and your business. This will be useful for the search engines to determine the page based on the user search item. robots.txt file in the root folder of the Magento will determine the architecture of your website for crawlers. In the “Edit Custom instruction” of robots.txt file field, enter custom instructions if needed. “Reset to Default” button will restore the default instructions. Use category path for the product URLs by navigating to System => Configuration => Catalog => Use Categories Path for Product URLs => yes. This will avoid duplicate content by generating the proper URLs for the products. Another checklist is to take a look at the images. Meaningful and relevant name to the image files helps to boost SEO. It is also a good practice to provide the “alt” keyword for the “img” tag. Ensure that you don’t have CSS and JS on your HTML page. Use external file for JS and CSS, and include them in the page using layout.xml. When you install Magento, it automatically gives you a few page titles like “Magento Commerce”. To change that navigate to Configuration => Design => HTML Head and give the title relevant to your website. Another parameter that helps SEO is by adding rich snippets like rating stars, price, currency, image, video to your store. This is enabled by default. Last but not least, check your page optimization to make your page to load faster. Search engines will give more weight to the faster websites. Check your PHP, JS and CSS logic to make the page faster. Make sure you have 301 redirect enabled. 301 redirect is a permanent redirect. Search engines will be informed as 301 when the web page is redirected to another URL. This is the best way to perform redirects. Magento 2 is SEO-friendly by default and it provides various options to configure SEO. 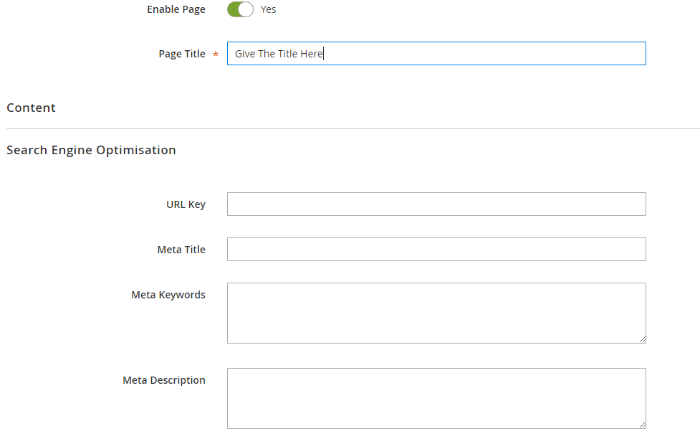 The blog has described how to set up Magento 2 but we have just scratched the surface…there are many more ways to optimize site URLs, page titles, meta and ALT tags, headings, and other web site elements. There are also third-party extensions available to improve SEO capabilities. We have highlighted the steps to setup Magento 2 SEO. If you have queries or comments, please do not hesitate to get in touch with us. Can your online store have better SEO? Let our experts check it out.